We are offering our valuable clients with a superb range of Chevron Glass Beads. Chevrons are very popular beads, and there are many large private collections in Africa, Europe and America. These beads remain in very high regard in Africa and are still worn to show prestige, at special ceremonies and are often buried with the dead. Size : Approx between 5 To 10mm. 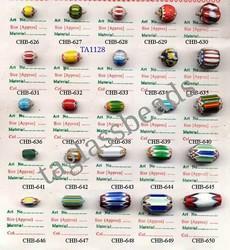 Finest chevron beads and available in different colors & shapes. We offer handcrafted range of bright and colorful chevron beads and will vary in size, color and shape. Usually made of glass these chevron beads are widely used in today’s fast developing fashion industry. Our craftsmen are also expert at making machined chevron beads of fine finish. 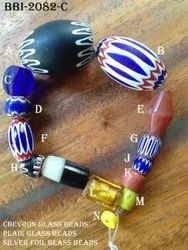 We offer very good quality chevron mix glass beads to our customer.